The French Mastiff is also known as the Dogue de Bordeaux. It is considered one of the more ancient of the French breeds. The Dogue de Bordeaux is most likely a mix of the English molosser (pugnaces Britanniae) and the Roman molosser (canis pugnaces), originating in the period when French Bordeaux was ruled by English kings (1203 – 1453) – who brought their own ferocious bull-, bear- and horse-baiting molossers (then called bulldogs) with them. Some fans argue that the breed also has some Tibetan Mastiff mixed in. In any event, the French Mastiff was one of the European molosser types that were developed and used for baiting large animals and for dogfighting, as well as for attacking wild animals during a hunt. The French Mastiff, like many breeds, almost died out during the second world war, but was salvaged after the war by fans of dogfighting. Present day Dogues de Bordeaux all descend from ten breeding pairs that were left after WWII. 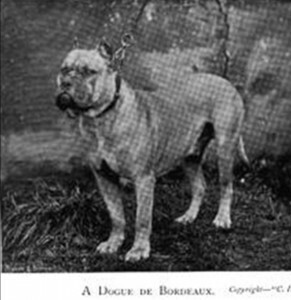 As with all of what we now call ‘breeds’, the Dogues de Bordeaux was just a regional variation of the many molosser types. It originally resembled the Cane Corso. As dog shows came into fashion in the 19th century, English Mastiff blood was again added to get the look of the Dogue de Bordeaux as we know it today. Despite being introduced in the United States in the 1890’s, the French Mastiff remains relatively rare. They gained some popularity in 1989 when one was featured in the film “Turner and Hooch”. The breed standard was reworded in 1993 in the hope of getting kennel club recognition, and this fighting molosser was finally accepted by the American Kennel Club in 2008. The Dogues de Bordeaux officially became a ‘breed’. 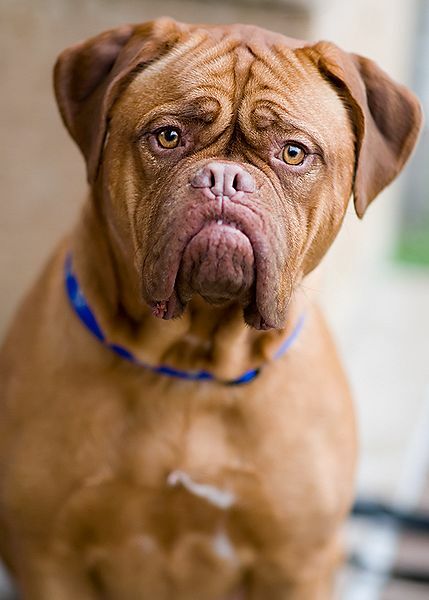 The French Mastiff is described by the fans as having a calm and even temperament, but despite their lumbering appearance they can be surprisingly agile. They are known for being loyal to their families. They are comical to watch due to their excessive snoring and drooling. They are a guard dog at heart and can react aggressively to perceived threats. They can be very confrontational and aggressive with strangers. Extreme caution should be taken when introducing them to unfamiliar people. 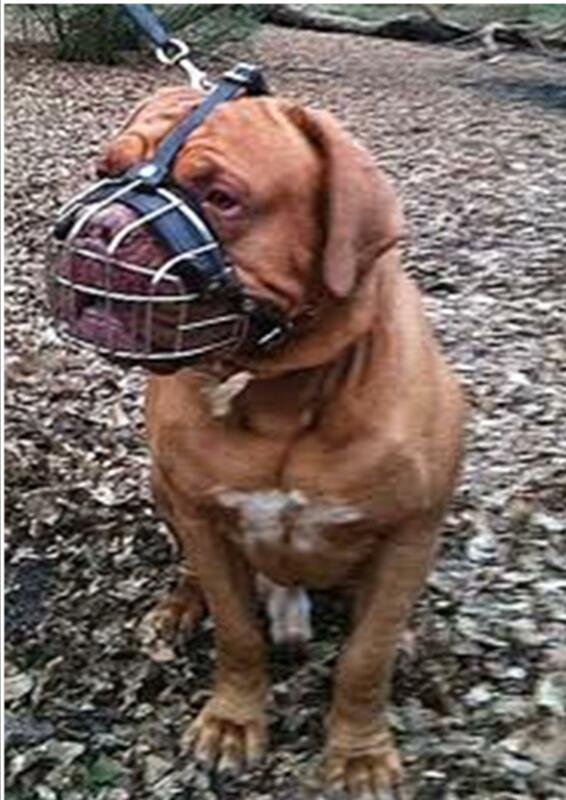 The French Mastiff has a long history of animal baiting and dogfighting and does not do well with other animals. Socialization from an early age may help reduce aggressive behavior towards other animals, but this is not a guaranteed prevention or solution. Many of these dogs, despite socialization become aggressive towards other animals, especially other dogs. 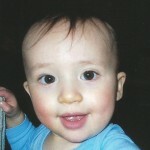 Caution should be taken when introducing them to other animals and allowing them to interact. 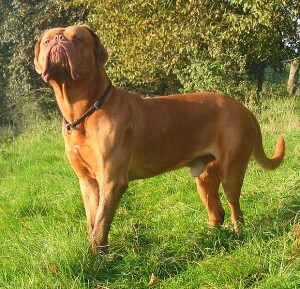 The Dogue de Bordeaux must be walked on-leash by someone large and heavy enough to control the dog. 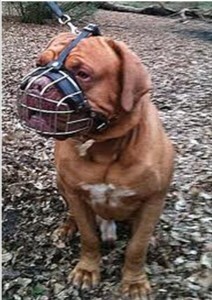 The French Mastiff does not belong at a dog park. The French Mastiff is a very powerful breed and requires confident and experienced owners. Obedience training and socialization as a puppy is essential, but may not prevent less desirable behaviors. Training must be consistent and maintained throughout the dog’s lifespan. If you are going to have the French Mastiff loose in your yard, you should have fencing adequate to contain the dog, so as to prevent attacks on passing animals or strangers. The fencing should be high enough that curious children can’t climb over it. Fans say the Dogues de Bordeaux does well with the children in its own family. However, considering the degree of animal aggression that was always desired in this dog, we do not recommend the Dogues de Bordeaux for families with young children. This breed requires minimal grooming and only moderate exercise. With their short snouts and heavy bodies, they are vulnerable to fatal overheating in hot weather. They should not be exercised or left out in the sun in warm weather. They slobber excessively (some fans fondly call them ‘mess machines’), are inclined to snore and to suffer flatulence. 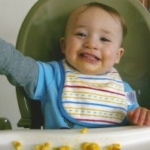 They can be susceptible to several medical issues such as breathing issues, sensitivity to the heat, ectropion, eye infections, heart issues, hyperkeratosis, epilepsy, and hip dysplasia. They weigh between 120-145 lbs and typically live 5-6 years. The oldest French Mastiff on record was 12 years old. In North America, from 1982-2015, the French Mastiff/Dogue de Bordeaux has been responsible for 2 serious attacks on humans. 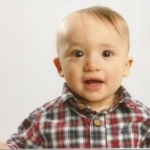 There have been no fatalities, but caution is advised due to their size and strength. Semencic, C, Gladiator Dogs, Digital Fabulists, 11684 Ventura Boulevard #205, Studio City, CA 91604, 1998. Semencic, The World of Fighting Dogs, T.H.F. Publications, Inc, 211 West Sylvania Avenue, Neptune City, NJ, 07753, 1984. Fleig, D, The History of Fighting Breeds, T.H.F. Publications, Inc, Neptune City, NJ, 1996. I believe that with the right owner and proper training and socializing this breed is not any more dangerous than than any other powerful breed. They are loving family pets.